Each 8-1/2" x 11" sheet of White 67 lb. Bristol is Scored Vertically, and Micro perforated Horizontally to create 2 Note Cards. 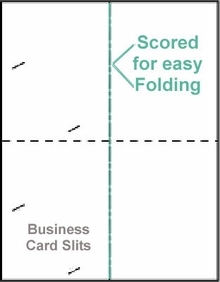 Diagonal slits are die cut for the insertion of a business card. Whatever your business or profession, you can create a perfect, personalized thank you note or other correspondence. Download a free "Word" Template on our Templates Page. Download the template, and experiment on paper if you are unsure.The template only provides the spacing for the tickets--it does not provide for numbering! 500 Note Cards, 2 per Sheet, 67# White Microperfed, 250 Sheets Folded Size 4-1/4" x 5-1/2"